The government tonight announced a new plan to raise extra bail-out money without further burdening hard pressed taxpayers. The news came in response to requests from the financial services and car manufacturing industries for additional finance to shield them from the free-market capitalism that they no longer wish to take part in, once it transpired that they were rubbish at it. "We have sunk billions of taxpayer’s gold into the banks, and now need help to break their blockade on lending, Hence we need an infusion of cash from people who have no trouble raising money, Somali Pirates," said the Chancellor of the Exchequer in a statement to the Commons. "This arrangement will reduce the burden on the taxpayer and improve the integrity and ethics of the financial system." Mr Darling was quizzed by MPs whether it was prudent to do business with an untrustworthy group, driven by their own greed who had a disregard for the rule of law, and responded that he had realised it wasn’t and it was time to stop doing business with bankers. "We have spent many years sailing in shark infested waters," said Alistair Darling MP. "Therefore it is time to leave the City and head for the safer seas of the Gulf of Aden. Unlike a banker, a Somali pirate may not wear a pin-stripe suit, but at least he has a good grasp of not only an AK-47 but how is own business model actually works." 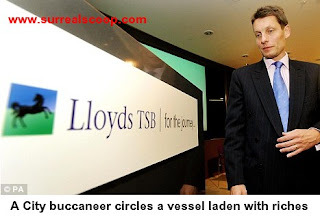 A pirate leader, Shamun Billingsworthbur, said at a press conference that he was pleased to be doing business with the treasury and joked that his ancestors had a long relationship with Her Majesty’s Government. "Many, many years ago, my forefather’s business was almost in ruin, due to the hard work and diligence of the Royal Navy on the Pirate Round," he said through his shoulder-based interpreter, Polly. "Generations later, how fitting it is that you should seek out the help of the cut-throats of the seas to rescue your economies now that the Pin-Striped Pirates have all your booty. However, I may be a murderous, condemned scourge, who has murdered the family members I have not sold, but I will not work with Andy Hornby. Even I have standards."